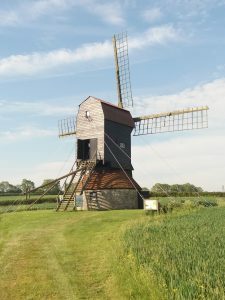 The windmill is undergoing substantial repairs and renovations during the summer of 2018. Amongst other repairs to the metalwork, to repair some of the main structural timbers involves jacking up the whole of the post mill (i.e. all the woodwork and sails etc, apart from the stone and tiled base section, to gain access to the ends of one of the main cross timbers. The weight being jacked up is estimated to be between 12 and 13 tons (or that might be tonnes?). We wish the renovation company all the best, and perhaps look forward to grinding grain there sometime in the future. Click here for more details on the Bedford Borough Council site.